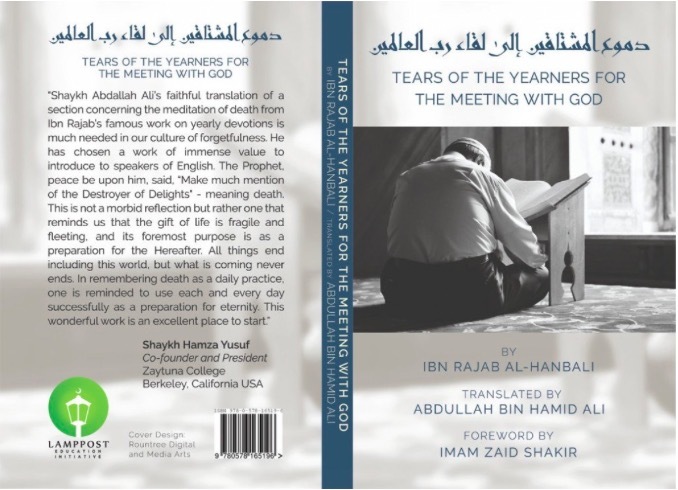 This is an interview with Dr. Abdullah Bin Hamid Ali of Zaytuna College on his book, Tears of the Yearners For the Meeting with God, as well as on spirituality. Dr. Abdullah bin Hamid Ali is a faculty member at Zaytuna College who teaches courses in Islamic law and prophetic tradition. He also coordinates Zaytuna’s Islamic Law program and serves as an integral part of its Living Links Honors Program, for which he teaches Jurisprudential Principles and Introduction to Islamic Virtue Ethics. A lifelong student of the Islamic tradition, he was born to Muslim parents and began a serious study of Islam in his early teens. He attended Temple University for two years (1995-1997) prior to pursuing studies that culminated in a four-year collegiate license (ijaza ‘ulya) from the prestigious Al-Qarawiyin University of Fes, Morocco (1997-2001). He holds a BA from the Al-Qarawiyin University’s Faculty of Islamic Law (Shariah) and an MA in Ethics & Social Theory from the Graduate Theological Union (2009-2012) in Berkeley, California. He recently completed a PhD in Cultural & Historical Studies at GTU. Dr. Abdullah’s book, Tears of the Yearners For the Meeting with God, is available here.